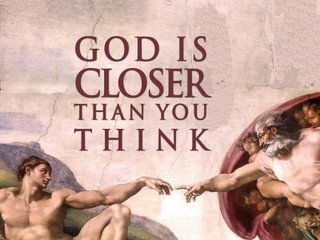 God Is Closer Than You Think #11 – What Are Sanctification & Perseverance? My overriding goal (for the series) has been for us to have a greater understanding and confidence in Who God is – and What God has accomplished on our behalf. Conversion = Repentance + Faith. Repent of sin and trust in Christ for salvation. This is our response to the gospel call. We see Paul’s dramatic conversion detailed in Acts 9. Justification – Immediately after conversion comes justification, which forever changes our legal standing before God. God declares us not guilty but righteous because of the finished and complete work of Christ. Adoption – Not only has our legal status changed but our family status is also changed as God makes us members of His family – with all the privileges of adoption. All of the above occur at the beginning of our Christian lives – we’ve believed, we’ve been forgiven of our sins, we’ve become members of God’s family – our status and relationship are forever changed. But what happens to us internally? Which brings us to what we want to look at this morning: Sanctification, which is a progressive work of God and us that makes us more and more free from sin and more like Christ in our actions. Let’s begin by considering some of the major differences between Justification and Sanctification. This is important because Catholics and Protestants have two very different perspectives on the difference. Roman Catholic doctrine doesn’t distinguish between justification and sanctification – it mingles them together and views them as one single process. In Catholic theology people are not entirely justified until they are perfect internally. So, in this life Catholic theology says we can never be fully justified. Catholics would say that the vast majority of people who physically die go to Purgatory to receive further purging or cleansing from sin until they finally we become “perfect” and are released into heaven. Catholics combine justification and sanctification – we separate them. How do we separate them? As we said last week, Justification has to do with our legal standing – it’s as if God is a judge pronouncing us, “Not guilty!” Sanctification has to do with our internal condition – What is the state of our heart? What is the state of our internal moral status? The difference between Justification and Sanctification is like the difference between a judge and a surgeon. The judge declares us righteous, which is something on the outside of us and is in relationship to God’s Law. But the surgeon goes inside and changes something in us, s/he fixes something. Sanctification is God working inside to grow us up, to fix us, to make us more like Christ. Justification is once for all time. Roms 5:1 – “Therefore, having been justified by faith, we have peace with God through our Lord Jesus Christ.” But sanctification continues throughout the rest of our lives. Justification is entirely God’s work, He pronounces us “Not guilty!” or, forgiven and righteous because of faith. Sanctification is something we cooperate with. Justification is perfect and complete in this life – it’s once for all time. God declares us not guilty. Sanctification is not perfect in this life…Sanctification is greater in some than in others. We are to make progress in our sanctification (1 Tim 4:15). Positional Sanctification –Our sanctification has a definite beginning. Our position of perfect acceptance with God at the moment we place our faith in Christ is where we begin. When a person becomes a believer there is immediately a change of heart and a growing desire to do what God wants (1 John 3:9). Progressive Sanctification — Our growth in Christ-like character and conduct during our life on this earth. After conversion there is a new ability to change – we are no longer helpless or trapped by sin. We have access to new power. Final Sanctification — Our ultimate perfection when we stand in Christ’s presence spotless and blameless – forever free from sin. (Like having had a cold or allergies… and then being able to breath again. V.1 — “Therefore, since we have so great a cloud of witnesses surrounding us, let us also lay aside every encumbrance and the sin which so easily entangles us, and let us run with endurance the race that is set before us. There are two parts of the sanctification process. Remember we said that Sanctification is a progressive work of God and us. We have both an active and a passive role in our own sanctification. Hebs 12:1 is speaking more to our active role. The word “witnesses” is the same word we get our English word ‘martyr’ from. The “cloud of witnesses” speaks of BOTH those who have gone before us AND those who are currently standing beside us. With the testimony of those who have gone before us (including Christ) and the community of those who are standing with us, we begin to ‘lay aside’ those idols (or functional saviors) that we used to turn to in order to seek comfort and joy. Now we turn to what Christ has done – and seek to find our comfort and joy in Him. Remembering what He has done – and taking comfort in the witness of the saints – past and present. Life is a race – regimen of difficulties. The word race (agōn) is the Greek word we get our English word ‘agony’ from. Life is an agonizing struggle. Exercise is necessary – the whole point is opposition. When I’m doing chest presses at the gym it ‘feels’ like I’m getting weaker, but I’m actually getting stronger – in the long run. We also wear gym clothes at the gym – and when we catch a glimpse of ourselves in the mirror we are reminded of why we are there. Our faith will never grow unless it’s challenged. One theologian and writer Eugene Peterson, author of the paraphrased Message, also wrote a book titled, A Long Obedience In the Same Direction. We are to ‘fix our eyes on Jesus’ (v.2) and we are to ‘consider Him’ (v.3). To put it simply: Jesus endured short-term pain because of the certainty of long-term gain. Our years on earth amount to less than a breath of eternity. The twentieth-century British pastor D. Martyn Lloyd-Jones said, “If we only spent more of our time in looking at Christ we should soon forget ourselves.” Fixing our eyes on Christ is the first step and the entire path of the Christian life. We don’t look to Christ in faith to be saved and then look to ourselves to persevere. We trust Christ alone as our Savior and look to Christ alone and follow Him as our Lord. In order to look to Christ as our Savior and Lord, we need new eyes and a new heart. The late beloved pastor James Montgomery Boice wrote that…The only thing that will ever get us moving along this path of self-denial and discipleship is fixing our eyes on Jesus and what He has done for us, coming to love Him as a result, and thus wanting also to be with Him both now and always. Jesus is our only possible model for self-denial. He is the very image of cross-bearing. And it is for love of Him and a desire to be like Him that we take up our cross and willingly follow Him (Mk 8:34, 35, 36). As we prepare our hearts for communion, let us remember that fixing our eyes means to look away from other things and steadfastly or intently toward Jesus – and what He has accomplished on our behalf. We are sustained in the marathon of life by the joy that we find through surrendering our idols to God, wherein we begin to find our true joy and delight in Him. Boice, J M and Philip G. Ryken. The Heart of the Cross, Crossway: 1999. Sermon: Be Constant in Prayer for the Joy of Hope.